In recent decades many countries transitioning from central planning to a market economy have introduced a competition regime. Competition policy can produce significant benefits for developing countries, including furthering economic development, improving social welfare, and increasing innovation and international engagement. However, there are substantial obstacles to implementation, including significant financial and human resource scarcity. The wider jurisdictional context may also hinder successful implementation; young agencies are tasked with building a competition culture amongst an often inexperienced legal community, confused public, and stakeholders that can range from disengaged to hostile. Although there are no straightforward solutions, technical assistance programs can perform a vital role in assisting young agencies to overcome these barriers. Success is strongly correlated to the program being tailored to the jurisdiction’s needs. Effective advisors impart technical and soft skills, act as a conduit between agencies, and ultimately empower new competition regulators to take ownership over the implementation process. Restraints of trade in employment contracts are as common as they are controversial. They have been criticised by many scholars and practitioners for their supposed detrimental consequences in restricting employees’ rights to use their skills and experience, promulgating an inequality of bargaining power between employers and employees, and limiting market competition. Acknowledging these criticisms, this article explains the reasons why restraints are both important and necessary in employment relationships. It also provides guidance about the contemporary common law approach used to determine the enforceability of employment restraints and may therefore assist practitioners in drafting enforceable restraints. The Personal Property Securities Act 2009 (Cth) provides for a register of security interests. It is commonplace for secured creditors to perfect their security interests by registering a financing statement with the Personal Property Securities Register. But beneath the appearance of a duly registered and effective financing statement may lie a seriously misleading defect – unbeknownst to the secured creditor. The effect of a seriously misleading defect is that the financing statement is ineffective to perfect the security interest. In an insolvency scenario such a security interest will vest in the insolvent estate. This article concisely considers the law surrounding the notion of a seriously misleading defect and the making of applications to cure such a defect under s 588FM of the Corporations Act 2001 (Cth). There appears to be an ever increasing trend of cyber incidences causing concern to corporations. Directors are also becoming under greater scrutiny to ensure that information technology assets and private and sensitive data are resilient to the various types of cyber risks. The lack of case law in Australia means that directors must look to overseas developments to see how persons affected by cyber losses seek redress against corporations and individual directors who fail to guard against such losses. Fortunately, there is a growing collection of private organisations, government departments and statutory organisations that issue voluntary guidance to assist directors and corporations to stay ahead of the risks. This article examines the steps that directors should take to avoid allegations of breach of directors’ duties (and possibly shareholder class actions) in the current cyber landscape. 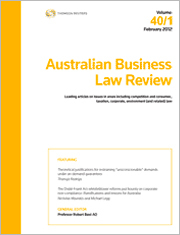 For the PDF version of the table of contents, click here: Westlaw AU – ABLR Vol 46 No 2 Contents or here: Checkpoint – ABLR Vol 46 No 2 Contents.